Already a trusted brand in the air-conditioning market, we are thrilled to help Mitsubishi Heavy Industries promote its range of world-class, highly efficient and stylish air conditioning systems to suit any room and interior of your home. As the cold season approaches, our new campaign aims to entice people to bring back summer so they can cruise through winter. 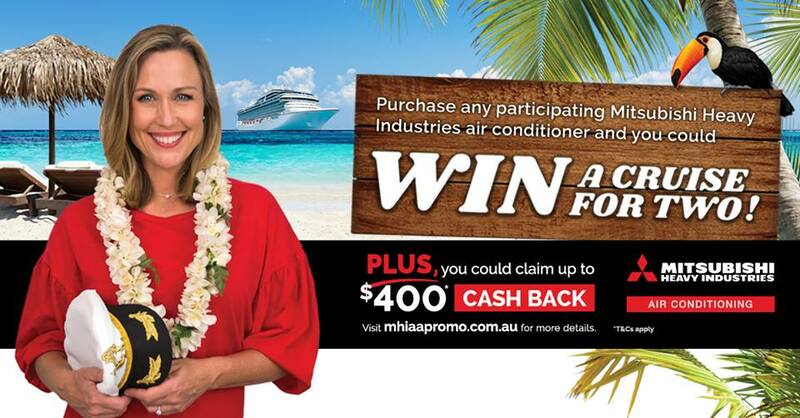 With the opportunity to go into the draw to win 1 of 4 tropical cruise adventures PLUS claim up to $400 cash back, there couldn’t be a better time to warm up your home with a Mitsubishi Heavy Industries air-conditioner! Featuring MHIAA ambassador Tara Dennis, the national 4- month campaign is running across Channel 7 broadcasts including a Better Homes and Gardens sponsorship, outdoor advertising, digital, press and on MHIAA owned social channels.